What is a big reason that children enjoy being on a junior indoor cricket team? It is mainly for the fun of taking part in a team event with other children their age and getting to use up their energy at the same time. 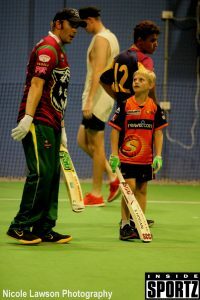 Indoor junior cricket teams from Australia have been making a name for themselves during various competitions, including the Indoor Cricket Junior World Series. Participants increase their learning of world cultures and geography while building memories of competition and performance. The sport of indoor cricket continues to grow in popularity from this type of recognition. Parents and children like the idea of indoor junior cricket games because participants can play any time of the year. It is a game that provides challenge and enjoyment for children and adults, whether they are new to the sport or just enjoy the game. Runs are scored in different ways. The higher-scoring team after two innings wins the game. Every player has the opportunity to participate in the game. Indoor courts are small enough to make it simple to be involved. The ball is softer than the ones used for outdoor cricket games. Depending on the age of the players, you may find teams made up of 6 or 8 players a side. Contact Indoor Sportz regarding the requirements to join indoor cricket for juniors. Members benefit by building skill and social development. They also learn rules and form so they can help with coaching and other positions as they grow older and join other teams. Junior indoor cricket develops agility and responsibility while your child has fun. We supply umpires for every game at every age group along with balls, bats and gloves. Gloves and boxes are available for purchase from our pro-shop.